When you become pregnant it is important to follow a consistent oral health routine. Pregnancy changes the hormones in the body that put pregnant women at increased risk for periodontal disease, which is the most severe form of gum disease. Tell your dentist as soon as you think you are pregnant, because it may not be safe to have X-rays during pregnancy. Be sure to tell your dentist what medicines you’re taking and if your physician has given you any specific medical advice, as it may affect the treatment he or she recommends. If possible, visit your dentist before pregnancy, so you can take are of any pre-existing dental problems before you get pregnant. The first trimester of your pregnancy is the time in which most of the baby’s major organs develop. 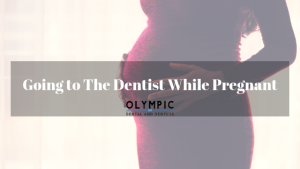 If you go to the dentist during your first trimester, tell your dentist that you’re pregnant and have only a checkup and routine cleaning. If possible, postpone any major dental work until after the first trimester. However, if you have a dental emergency, don’t wait! Infections in the mouth can be harmful to you and your baby. See your dentist immediately, and make sure that all dental professionals who examine you are aware you’re pregnant.